Changer XP - Set Images as Logon Screen, Desktop Wallpaper, IE Skin etc. Chnage XP can set your favourite images (BMP, JPG, GIF, PNG, TIFF, TGA and WMF format are supported) as your logon screen, desktop wallpaper, IE skin and screen saver, and set the screens to change automatically after a specified time period (e.g. every 30 minutes) and even change them in days, hours, minutes and seconds! 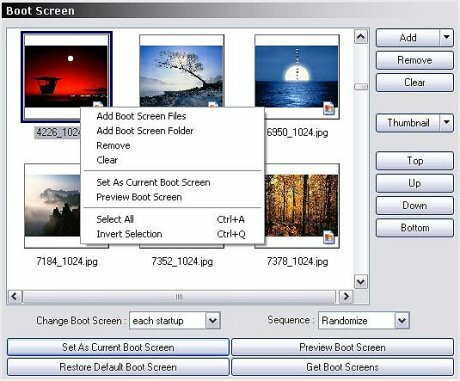 Change XP supports image re-sampling with interpolation and averaging to produce the best quality image for the boot screen and desktop wallpaper and supports thumbnail view and colour reduction with image dithering to keep the quality of the source image for the boot screen, desktop wallpaper and IE skin. You can select hotkeys to access features of Changer XP quickly. There is also complete multi - language support with run-time language switching. Boot Screen changer, Win XP Logon Screen changer, Desktop Wallpaper Changer, IE Skin Changer and Screen Saver changer all in one. You can program desktop wallpaper, Win XP logon screen, IE skin, screen saver and boot screen to change automatically after a specified time period (e.g. every 30 minutes). You can even change them in days, hours, minutes and seconds! Support image re-sampling with interpolation and averaging to produce a best quality image for boot screen and desktop wallpaper and support thumbnail view. Support color reduction with image dithering to keep the quality of the source image for boot screen, desktop wallpaper and IE skin. Support hotkeys to access features of Changer XP quickly. Use system tray to ease your control of Changer XP anytime and Setting and preview screen saver by context menu. JPG, BMP, TGA, GIF, PNG, TIF, WMF , EMF , TGA files and modified ntoskrnl.exe files are supported and fully support active desktop. Complete multi-language support, with run-time language switching and Auto check new version online at startup. IconChanger - perfect change Icon software to change desktop icons, change folder icons, customize computer icons ! SmartPOP2Exchange - forwards messages from POP3 server accounts to any SMTP server ! Easy Screensaver Creator-Express - The fastest and easiest way to create share screen saver and resell it.